style="margin: 1em 0px; color: rgb(0, 0, 0); font-family: AvenirNextLTW01-Regular; font-size: 14px; letter-spacing: normal; line-height: 20px; ">First, some cold, hard facts. FACT: A signed first edition of William Burroughs’ Naked Lunch will set you back $2,000 at Powell’s City of Books. FACT: You can get it in digital format for $10.91, or free if you’re willing to click on some sketchy-looking pdfs. FACT: I sometimes miss holding things in my hands. FACT: It’s not an either/or proposition. Last week I visited Portland, Oregon; naturally, my first stop was Powell’s and its 68,000 square feet of books. 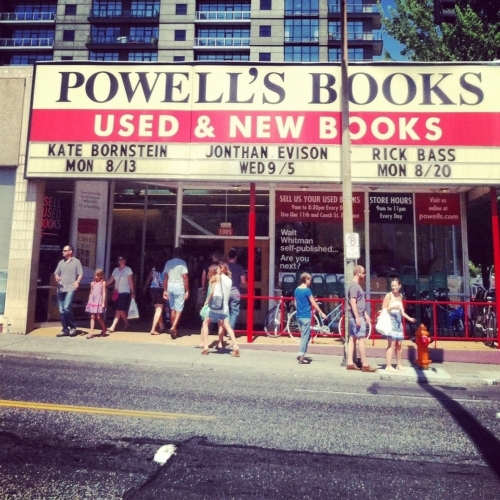 While it does have thriving e-book and print-on-demand departments, Powell’s is primarily a living monument to the printed word, a magical place where throngs of readers crowd the aisles in the middle of a weekday. I had been thinking a lot about the alleged death of print, so I climbed the stairs to the Pearl Room, which houses the rare books. The rare books are kept in a climate-controlled glass enclosure and monitored by a friendly and vigilant employee; the room has more in common with a museum than with the ramshackle chaos of the fiction aisles downstairs. The attendant and I get to talking, and soon enough I've arrived at several theories about the future of the printed word. 1. A book’s value is not necessarily linked to content, but a book’s value is totally linked to content. Popularity can decrease value because when a book is popular, more copies are printed, and editions become ordinary. The most exciting collectibles work both angles: they surpass popularity and vault into that unique realm we call a “classic” or (machismo intended here) “seminal.” East of Eden versus Eat Pray Love is no contest. However,East of Eden versus the first Harry Potter might get tricky, due to the ever-present wrench of fan obsession. And cover art matters. 2. E-books and e/print hybrids push readers away from collecting because the content is not encased in a physical object; it is always available, always floating in the ether and ready for consumption. 3. At the same time, e-books push us in a more accelerated fashion toward collecting books, because we fetishize the physical object more. When technologies go obsolete, their artifacts become more collectible. The boards and pulp become special. Rare. 4. As publishers get more creative with electronic and hybrid print/electronic packages, what constitutes a “collectible” edition of a given title is unclear. 5. As books change, bookstores will change. Powell’s may become more of a museum and less of a store — an archive, a physical representation of literature. It’s already halfway there: most of the customers I see crowding the entryway are there to buy souvenir tote bags and t-shirts, not books. 6. I don’t think printed books will ever disappear entirely, but they are certainly in the process of losing their popular monopoly. As e-books grow in prominence, used bookstores grow more specialized; independent stores will carry a smaller spectrum of titles geared toward small, dedicated audiences. Like vinyl record stores, bookstores are on their way to becoming boutique retailers, with a customer base made up of aesthetes and collectors. Print freaks. 7. Powell’s has a 1924 edition of Nathaniel Hawthorne’s House of the Seven Gables hand bound by Virginia Woolf. It’s $9,500. When I hold it, even through plastic, I pause. I think about Woolf’s hands holding it. She madethis book. Does that make me want to read it? Not particularly. But it kind of makes me want to take it home and pet it whenever I want.